A track man, Stacey was part of a team at Florida that set the nation’s fastest time in the 4×200 relay with 1:26:31. The first pick of the Colts in the 4th round of 1990 that played both receiver and punt returner, Stacey saw playing time also with the Buccaneers, before heading over to the Orlando Thunder in 1992. 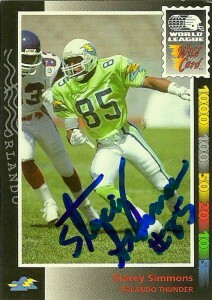 After a short off-season with the 49ers, Stacey found a home for 8 seasons in the Arena Football League playing for the Tampa Bay Storm, winning two AFL Championships. I have to give credit to Sotl for this find, as I had given up on this one some time ago. Seeing his name on the website, I easily recognized him as a member of the Orlando Thunder and nudged him a bit for those autographs and amazingly they arrived a bit over a year and a half later setting a new record at a fat 579 days. He also included a nice note for it taking so long and welcomed me to check out his site at www.staceysimmons.com. It’s amazing looking at these autographs from the two posts gotten some 20 years apart, and realizing that the autograph is authentic, because the signature is still the same.